Perched above the resort, Equinoxe is a spectacular Domaine de la Forêt neighbourhood. 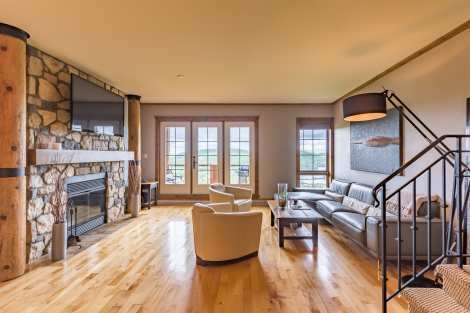 Built onto the mountainside, these luxurious properties overlook the town and offer an unequalled panoramic view of the Tremblant valley and lake. These upscale condos and townhomes feature spectacular architecture and cozy decor. From the heated indoor garage, the elevators take you right to your door. There's also an all-season shuttle that provides transportation between the complex and the pedestrian village, so you don't have to drive. Beautiful landscaping harmoniously blends the area's natural features, with aquatic facilities, paths and play areas. In summer, an infinity pool nestled in the rock is a great place to unwind, bask in the sun and admire the lake view. 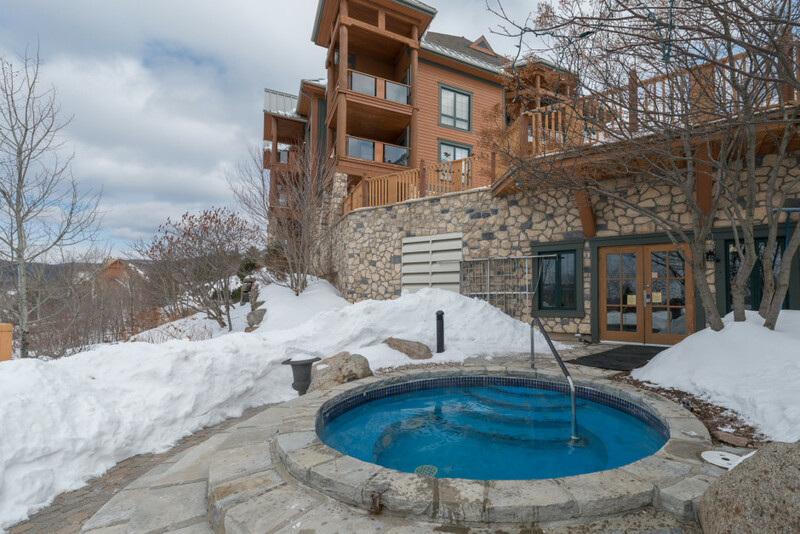 Hot tubs reserved for guests are open year-round. And there's a lovely little playground for the kids. 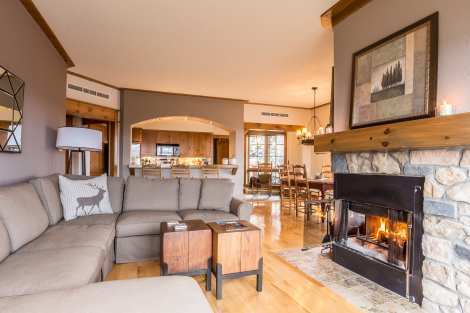 Équinoxe is the ultimate spot to reserve for get-togethers with skiers, hikers, family and friends. It offers direct access to the Porte du Soleil chairlift, and is only a ten-minute walk to the heart of the action, restaurants and shops. Relax in luxury. 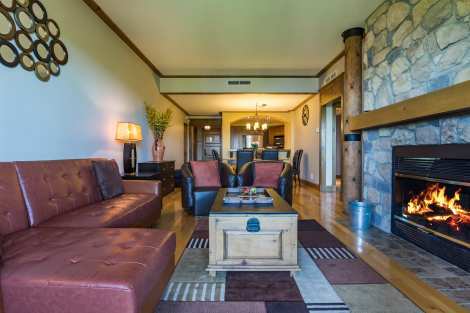 This Platinum Equinoxe is a 1 bedroom vacation condo features a double sided fireplace! Luxurious two-bedroom,two-bathroom condo. 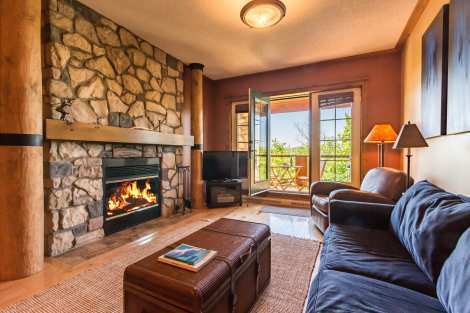 The eye-catching architecture, gorgeous mountain setting,rustic wood trim and double-sided wood-burning fireplace make it incredibly inviting. 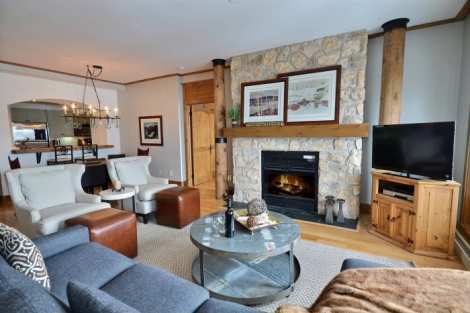 Don’t be surprised if you get the urge to stay in, to make and enjoy a great meal in the enveloping comfort and peacefulness of this home away from home.The master suite is beautifully appointed, with a king-size bed, private bathroom with therapeutic bath and wood-burning fireplace. The second bedroom has a cozy queen-size bed and tasteful dressers. The balcony, which gives the impression of floating over the lake and mountains, is a wonderful place to unwind in summer.Air conditioning and heated tiles add to the comfort. The unit is also equipped with wireless internet, two TVs and DVD players. Sumptuous two-story condo with two bedrooms and two bathrooms. 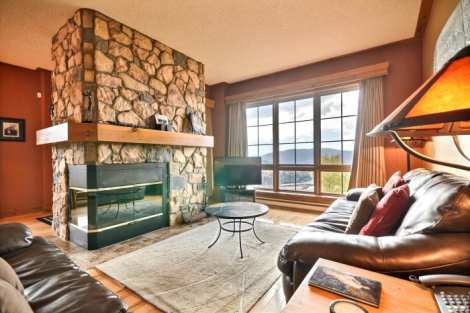 One of the best units available for rent, it is absolutely perfect for a memorable mountain getaway. The living areas are spacious, bright and have great flow. 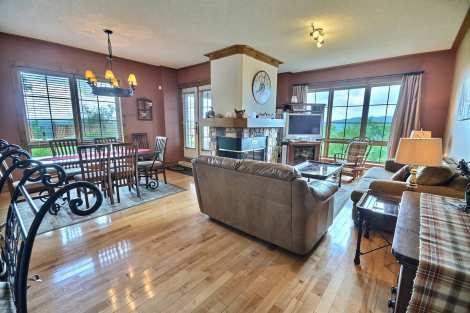 We love the abundant windows, hardwood flooring and heated tiles. The kitchen is fully-equipped for making delicious meals. In the living room, guests can relax in front of the wood-burning fireplace in winter or open the door to the balcony to let in a nice breeze in summer. The gorgeous master bedroom has a wood-burning fireplace, private bathroom with whirlpool tub,queen-sized bed and dressers for your things. On the upper floor, the second bedroom has a cozy queen-size bed and dressers. The second bathroom is right next door. Guests’ comfort is further ensured with air conditioning, wireless internet and an HDTV with DVD player. 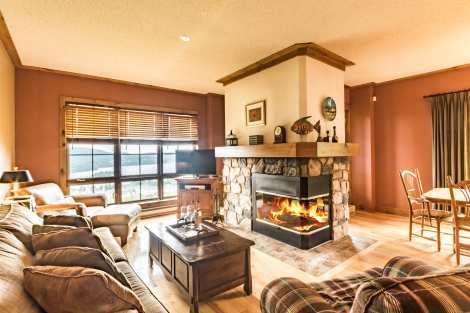 Spacious two-bedroom, two-bathroom condo right on the slopes. 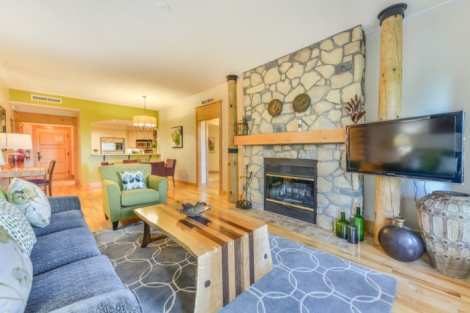 We love the generous space, heated tiles, wood-burning fire place and air conditioning. The kitchen has everything needed to prepare a quick meal or a nice supper enjoyed with a glass of wine. In the evening, retreat to the master suite, with its lovely stone fireplace, queen-size bed, dressers and full private bathroom. The second bedroom is furnished with a queen-size bed and dressers and is right next door to the second full bathroom. In the summer,the balcony lets you spend more time outdoors, breathing in the clean mountain air while admiring the view of the lake, valleys and peaks. Wireless internet,HDTV with DVD and Blu-Ray players and a compact sound system complete the amenities. Charming two-bedroom, two-bathroom vacation home that can sleep five. We fell in love with the recently upgraded kitchen! 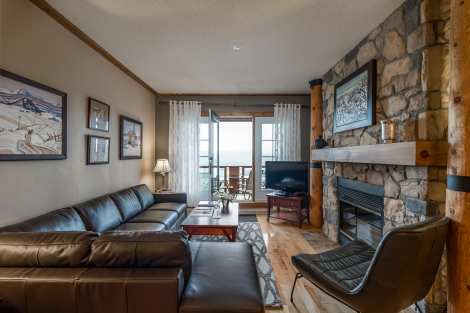 In this unit, comfort is assured by air conditioning, heated tile floors and an impressive two-sided wood-burning fireplace that adds rustic warmth to the space. The classic decor includes gorgeous wood trim. The bedrooms are comfortable and spacious. And the view is just unbeatable! 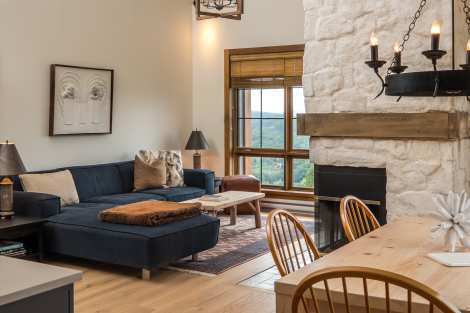 In the summer,guests will enjoy spending time on the balcony, admiring the mountain landscape.The master suite has a queen-size bedroom and private bathroom. The second bedroom has two singles. Wireless high-speed internet, two TVs and a DVD player are provided for guests’ entertainment. 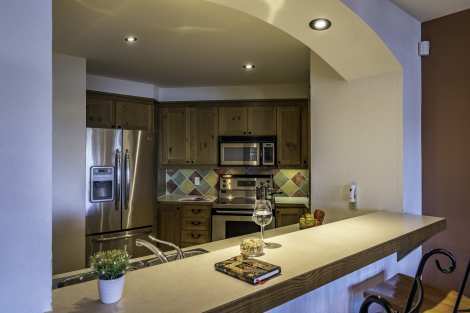 This large condo with a cathedral ceiling and three bedrooms and three bathrooms can accommodate eight guests. 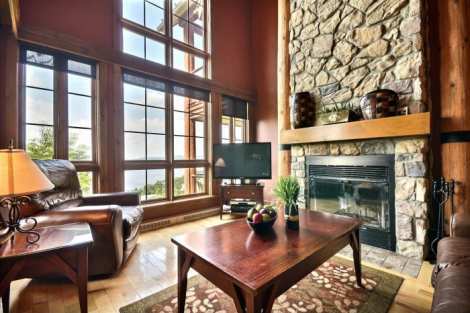 It's a bright spot with ample windows that offer a view of the gorgeous scenery. 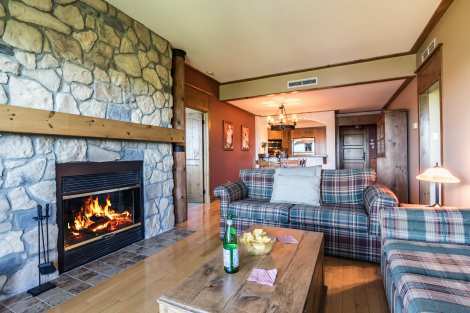 The open-concept main area includes a well-equipped and functional kitchen, a comfortable living-room with wood-burning fireplace, a large dining table, as well as access to two roomy balconies. The master suite is furnished with a king-size bed, cable TV, a full bathroom with heated floor, as well as a balcony. The second bedroom has a queen-size bed, and the third has two twins.The unit is equipped with wireless high-speed internet, three cable TVs and one DVD player. Luxurious classic-chic property to share with family or friends. Accommodates up to 10 people. Three bedrooms and two bathrooms. Bright and airy space, with a fully-equipped kitchen. 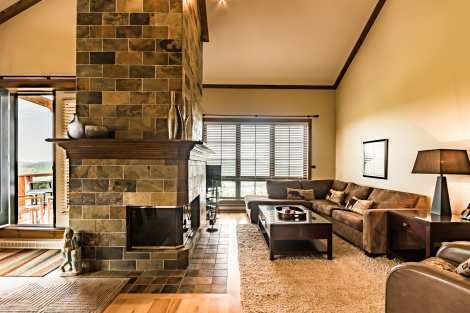 We like the wood trim and wood-burning fireplace that gives a cozy feel to the main room. The spacious master suite has a king-size bed, private bathroom and balcony. The second room has a queen-size bed, while the third is furnished with a bunk bed comprised of one double bed and one single. In summer, enjoy the air conditioning and balcony with BBQ. Recreational amenities include wireless internet, Apple TV, a high-fidelity sound system and an HDTV. 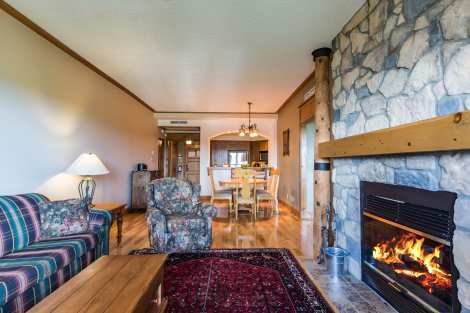 A wonderful vacation home, perfectly situated for a wonderful stay! Large, luxurious condo with three bedrooms and two bathrooms. 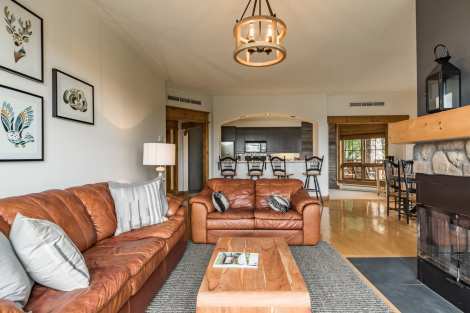 Can comfortably accommodate a family of six.This classic and inviting vacation home is the perfect space to unwind and regroup between activities. 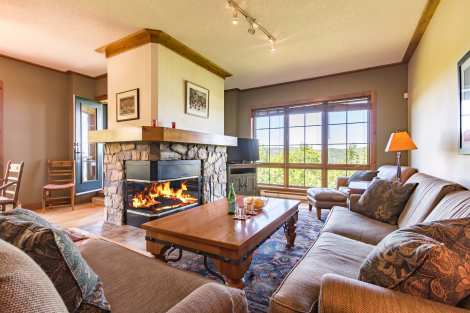 Comfort and enjoyment is assured by air conditioning, heated tiles, a two-sided wood-burning fireplace and two balconies overlooking the lake and mountains. The kitchen is fully equipped for making gourmet meals, if one is so inclined. 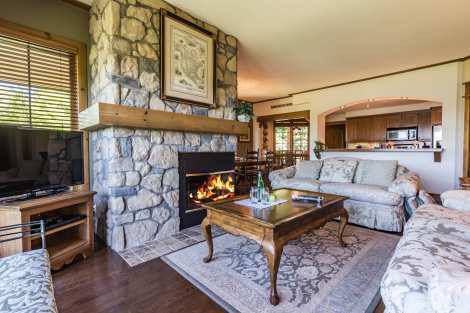 In the living room, a comfy sofa and leather armchair let guests linger in front of the fire. The master bedroom has a king-size bed, full bathroom with jet tub, and a spacious balcony. The second bedroom has a queen-size bed and the third is furnished with two singles. The unit is also equipped with wireless internet, three TVs, Blue-Ray and DVD players and a sound system. This expansive three-story town house offers all the space you could need for a great vacation with family or friends: four bedrooms, three full bathrooms, one half-bath, two living rooms, two balconies and a deck with private hot tub! Well-planned space for a hassle-free vacation. The location is truly ideal. Directly access the ski hill or hiking path right next to the parking lot. One living room has a cathedral ceiling, is bathed in natural light and is heated by an immense wood-burning fireplace. 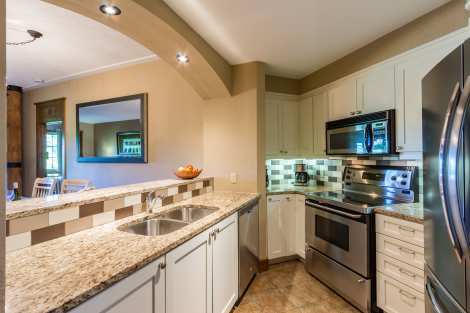 The kitchen has plenty of space and all the equipment needed to prepare quick or more elaborate meals. A large dining table is a great spot for everyone to make plans or chat about their day. The air conditioning and heated tiles ensure comfort according to the season. Wireless high-speed internet, five TVs, three DVD players and a compact sound system complete the amenities in this wonderful vacation home. 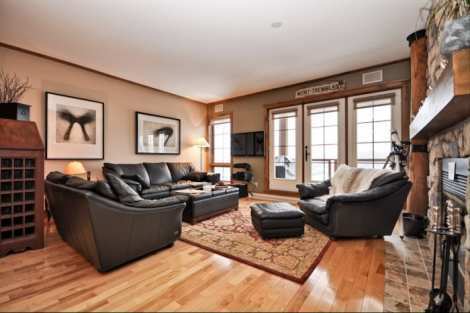 This spacious three-storey, four-bedroom town home can comfortably accommodate nine people. 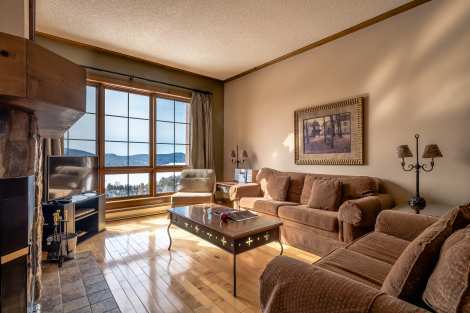 The main room has an abundance of windows that offer a stunning panoramic view of Tremblant Lake and the pedestrian village. The massive wood-burning fireplace rises all the way to the cathedral ceiling. 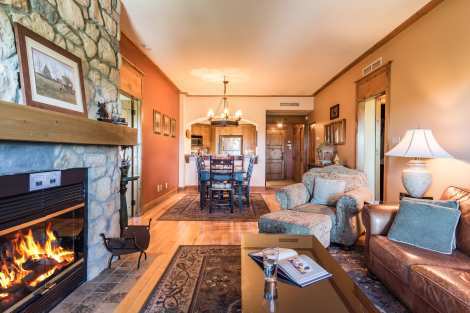 Rustic chic architecture gives this property warmth and flair that's one of a kind. The large kitchen has everything needed for meal preparation. In the dining room, all the guests can gather around the large pine table. There are three lovely bedrooms on the top floor. The master bedroom has a king-size bed, private bathroom and balcony with a view that plunges down to the lake and faces the sunset. The other two bedrooms share a bathroom with a shower-bath. One bedroom is furnished with a double bed and the other, with a queen-size bed. 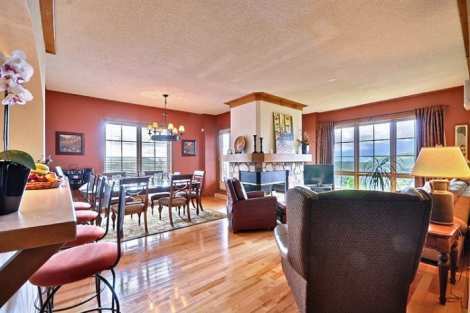 On the ground floor is a large living-room, a bedroom with a queen-size bed, full bathroom and small patio. This townhome is air-conditioned, features heated tile floors, and comes with wireless high-speed internet. The staff were very helpful at check in as well as staff working in the condo building. Although we have very limited ability to speak French, the staff always tried to speak English and help us in any way they could. This is our 8th time visiting and staying with you! We look forward to this trip every year! We would recommend it to anyone! We loved the condo, underground parking and the view. My only complaint was that we booked because there was a pool and hot tub. Unfortunately we did not have access to the pool until Sunday.